Oops - we don't appear to have a video for the DocuMate 162. Do you want to do more with the paper on your desk? Would you like to make it disappear and then be able to find it again within seconds? Sounds time consuming doesn't it? How about if you could do all that with just one touch? The Xerox DocuMate 162 is a new desktop scanner that can do all this and more. The DocuMate 162 includes Visioneer OneTouch , and with advanced TWAIN and ISIS drivers that will allow you to communicate with hundreds of enterprise content management (ECM) and document image management (DIM) software solutions with the press of a single button. With an amazingly small footprint, the scanner fits comfortably on any desk making it the perfect solution for any business that desires to quickly convert paper documents into searchable PDF files that are easily shared, organized and protected. And with Visioneer OneTouch with Kofax VRS technology, your imperfect originals are enhanced, straightened and cropped automatically with that same touch of a button, easy, simple yet powerful. Document imaging is rapidly growing in nearly every business today. 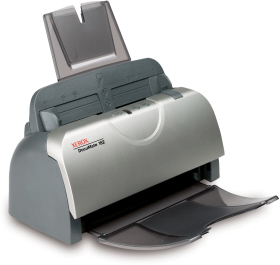 The Xerox DocuMate 162, color sheetfed document scanner, scans up to 50 images per minute (ipm) in duplex mode, includes a 50-page automatic document feeder to handle business cards and checks to legal size documents. The scanner offers a professional software bundle that includes Nuance PaperPort and OmniPage Pro for desktop document management and OCR. Many scanners today have scan buttons as well, but buyers beware, all buttons are not created equal. Only Visioneer OneTouch initiates and completes the scanning process and delivers your document to the application, folder or device of your choice. No additional clicks, no additional steps. As more users adopt scanning solutions at the desktop, it has become clear that ease-of-use is a key feature. Most new users in document imaging are not scanner experts, so simplified, point-and-click solutions that deliver high quality images and integration with business applications are in demand. The Xerox DocuMate 162. It will make your paper more productive and make you look good too! The Xerox DocuMate 162 includes an advanced TWAIN driver and Certified ISIS that will allow you to communicate with hundreds of enterprise content and document image management (DIM) software solutions with the press of a single button. The Xerox DocuMate 162 software bundle allows users to automatically scan to image-over-text searchable PDF. Searchable PDF maintains the visual integrity of the original document, with the text portions of the image converted via OCR for search purposes and stored in a separate layer. This allows for low-cost conversion from paper to PDF, while permitting easy distribution and ability to search, link, select/copy and index the text. Nuance PaperPort software lets you convert existing electronic files to PDF for storage or transfer. You can also convert existing, previous scanned legacy documents or even electronic files to PDF or Searchable PDF.